Not to be confused with the Taijitu symbol or the Technocracy movement symbol. For other senses of "monad", see Monad. 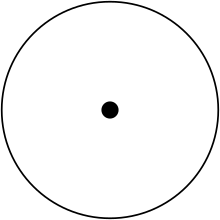 Monad (from Greek μονάς monas, "singularity" in turn from μόνος monos, "alone") refers, in cosmogony, to the Supreme Being, divinity or the totality of all things. The concept was reportedly conceived by the Pythagoreans and may refer variously to a single source acting alone, or to an indivisible origin, or to both. The concept was later adopted by other philosophers, such as Leibniz, who referred to the monad as an elementary particle. It had a geometric counterpart, which was debated and discussed contemporaneously by the same groups of people. According to Hippolytus, the worldview was inspired by the Pythagoreans, who called the first thing that came into existence the "monad", which begat (bore) the dyad (from the Greek word for two), which begat the numbers, which begat the point, begetting lines or finiteness, etc. It meant divinity, the first being, or the totality of all beings, referring in cosmogony (creation theories) variously to source acting alone and/or an indivisible origin and equivalent comparators. Pythagorean and Platonic philosophers like Plotinus and Porphyry condemned Gnosticism (see Neoplatonism and Gnosticism) for their treatment of the monad. For the Pythagoreans, the generation of number series was related to objects of geometry as well as cosmogony. According to Diogenes Laërtius, from the monad evolved the dyad; from it numbers; from numbers, points; then lines, two-dimensional entities, three-dimensional entities, bodies, culminating in the four elements earth, water, fire and air, from which the rest of our world is built up. The term monad was later adopted from Greek philosophy by Giordano Bruno, Leibniz (Monadology), John Dee, and others. ^ Compact Oxford English Dictionary. ^ Fairbanks, Arthur, Ed., "The First Philosophers of Greece". K. Paul, Trench, Trubner. London, 1898, p. 145. ^ Sandywell, p. 205. The generation of the series of number is to the Pythagoreans, in other words, both the generation of the objects of geometry and also cosmogony. Since things equal numbers, the first unit, in generating the number series, is generating also the physical universe. (KR: 256) From this perspective ‘the monad’ or ‘One’ was readily identified with the divine origin of reality. ^ Diogenes Laërtius, Lives of Eminent Philosophers. Sandywell, Barry. Presocratic Reflexivity: The Construction of Philosophical Discourse C. 600-450 BC. Routledge, 1996.